Saying the word ‘Congratulations‘ truly matters. It is a joyful exclamation people use when someone has reached a milestone of some sorts. Offering congratulations is one’s way of commending someone on achieving a goal or accomplishing something difficult. We, therefore, congratulate someone if they have graduated, or have received a promotion at work they worked incredibly hard for. Saying the words ‘congratulations’ is also a way of recognising and supporting someone’s happiness and good fortune. This is why we congratulate people when we hear they have gotten engaged or have tied the knot! When good things happen, we should react positively and acknowledge the event because it’s polite. It is also important to recognise the good things. Bad things happen daily. It’s very easy to get caught up in the negative and consequently cultivate a cynical attitude towards life. Be grateful for the positive things in life and celebrate the blessings of others. After all, “The surest way to be happy is to seek happiness for others.” – Martin Luther King Jnr. Say ‘Well Done’ with a candy jar full of sweetness! 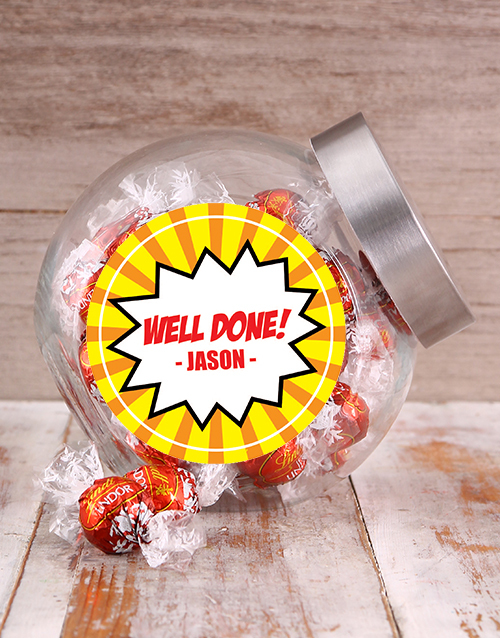 A clear candy jar has been personalised with a bright and beautiful speech bubble design, complete with the lucky recipient’s name. Inside the jar are mouth-watering Lindt Milk Truffles (30). Send this congratulations gift for him! Send a loved one your best wishes with the Congrats Cupcakes from the Bakery at NetFlorist! 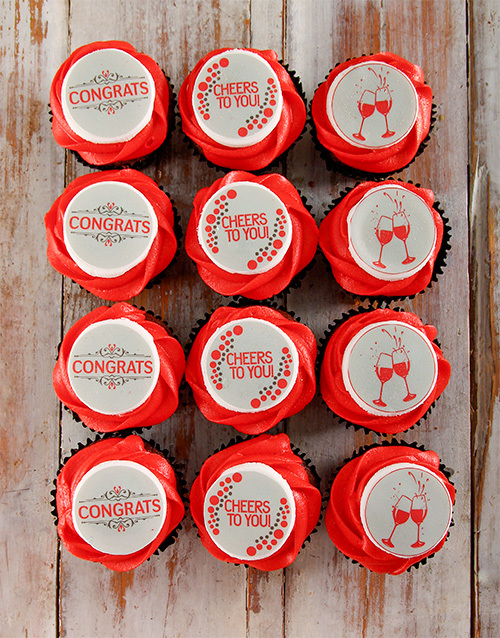 Decadent chocolate cupcakes with vibrant red butter icing are decorated with fun edible toppers with sayings like “Congrats” and “Cheers to you” as well as cheeky sparkling wine glasses! When a loved one has done something super special like graduate, start a new job or gotten engaged then these special cupcakes are the perfect gift to send them. Order these delicious cupcakes from NetFlorist today! 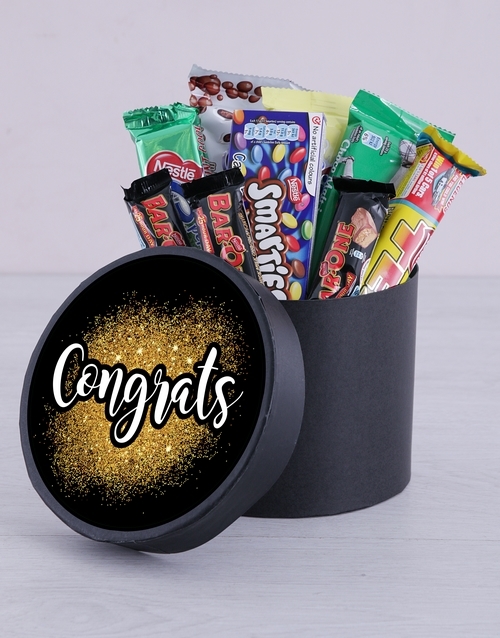 Say congrats to that special someone with this treat-filled hat box which has a unique ‘Congrats’ sticker design. Inside, is a selection of yummy chocolates including Milo Bar (80g), Milky Bar (80g), Aero Milk (85g), Tex (40g), Smarties (70g), Peppermint Crisp (49g), and Bar One (3 x 21g). 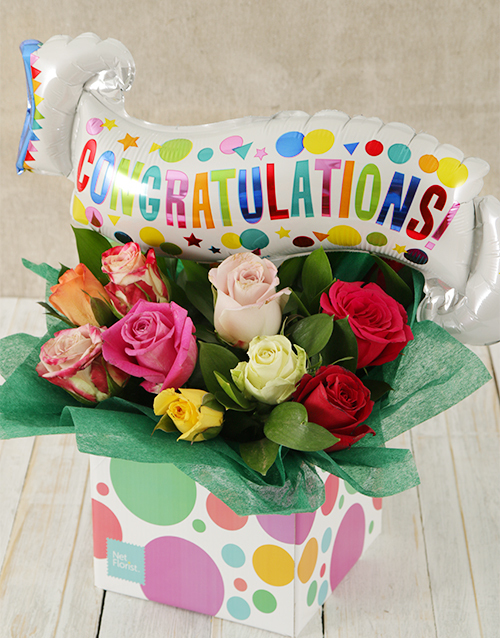 Say congratulations in style with this colourful and vibrant Mixed Rose & Congrats Balloon Box. Twelve gorgeous roses in a variety of colours are nestled among ruscus and green tissue paper in a polka dot occasions box. Accompanying them is a playful congrats banner balloon, making this a gift that will show the recipient just how proud you are. 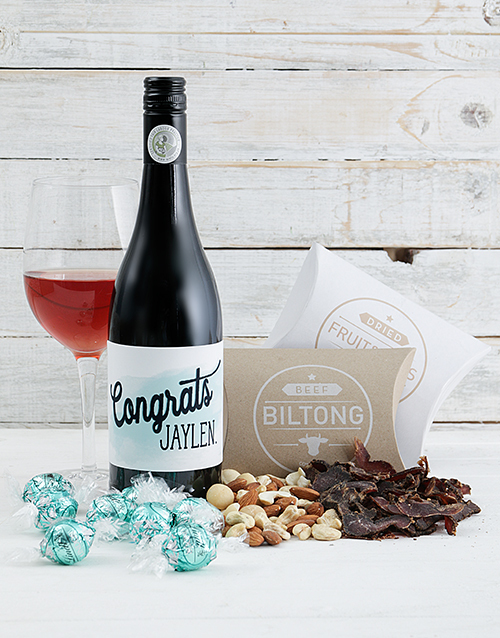 Say congrats with this fantastic gourmet hamper which consists of mixed nuts (100g), sliced biltong (100g), Lindt Coconut Truffles (8), and a bottle of red wine with ‘Congrats’ label design which is also personalised with a message. You can’t say congratulations without popping a bottle of bubbly. At NetFlorist, we have the perfect gift for congratulations – white gift basket with an areca bamboo, a bouquet of roses and chrysanthemum, a Congrats balloon, a cute and fluffy teddy, Ferrero Rocher chocolates and a bottle of non-alcoholic J.C. Le Roux bubbly is the perfect way to celebrate special achievements! Surprise that Mr Know-it-all in your life with this awesome Bro-Bucket! 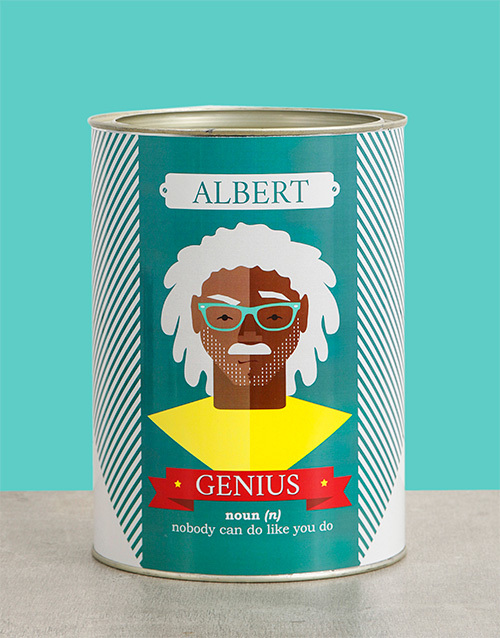 This bucket is branded with a unique ‘Genius’ label design which is personalised with his name, and inside you can choose from two amazing variants: An alcoholic option which includes Pringles (110g), Aero (85g), Japanese Crackers (100g), Droewors (100g) and Nederburg Baronne (250ml) OR a non-alcoholic option which includes Oreo Cookies (175g), Aero (85g), Japanese Crackers (100g), Droewors (100g), and Pringles Hot & Spicy (110g). Either way, this is one gift that is sure to impress!